Last summer at some point I found some kind of vague schedule for when you’re supposed to be trimming and pruning certain things in your garden. Technically, January was when I was supposed to hack back the grape vine, and February is when I am supposed to be pruning the citrus. I have no idea if this is correct or not, but I figured I might as well go with it. And hey, considering that so far the grapevine has thrived on complete and utter neglect, giving it a bit of a chop couldn’t do much to hurt it. So I went out and cut away a couple big patches of the vine, as well as cutting down some of the stupid pecan tree saplings that have been sprouting up amid the giant tangle that happens when you leave a grapevine untended for 3+ years (there is a pecan tree in the neighborhood, and the squirrels diligently bury the nuts all over the place, such that I am forever having to yank up tiny little pecan trees from everything. Years from now, when the zombie apocalypse is over and the neighborhood is deserted, it will morph into a healthy pecan orchard, and this is why). I also took a whack at the two citrus trees in the front yard. I have been hesitant to do much with them because they’re small yet, and while any plant in our yard must be hardy enough to survive benign neglect, these things definitely needed some help. They now look more like trees and less like unsightly bushes, so here’s hoping I didn’t completely kill them in the process. Anyway. Here is today’s snowflake. 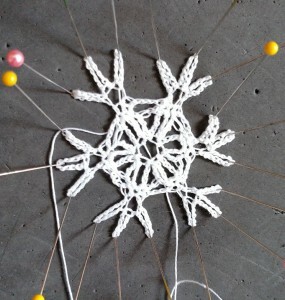 When I started working on it, I was struck right away by the fact that, unlike every other snowflake pattern in the book so far, this one did *not* start with me chaining 6 stitches and joining them into a circle. At first I thought perhaps this was an error, but then I read the next row and it didn’t make sense if there was supposed to be a circle to begin things with, and I reminded myself that this book has been out a long time, so I took a deep breath and just plunged right in, and eventually it sort of started to make sense. This entry was posted in Garden, Knitting. Bookmark the permalink.